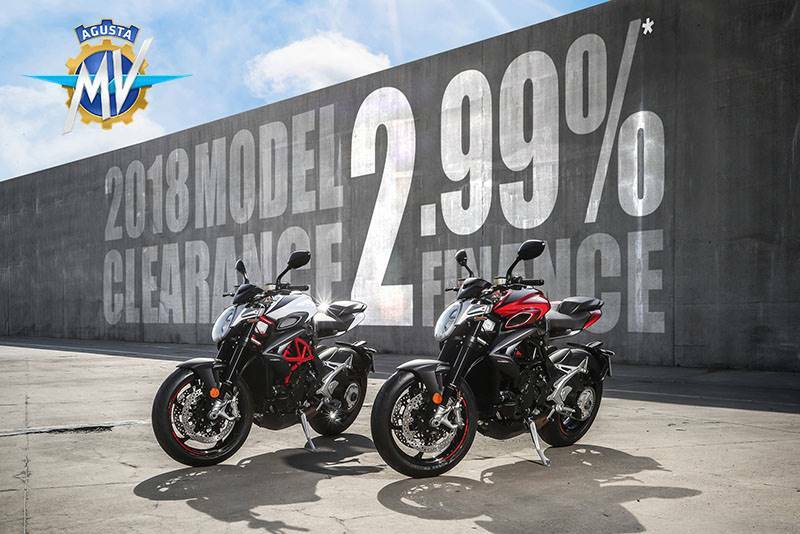 *Offer applies to new, untitled 2018 and 2017 MV Agusta models as indicated, subject to availability. Financing offer available through FreedomRoad Financial (FRF), a loan production center of Evergreen Bank Group. Annual Percentage Rate (APR) of 2.99% for 36 month term, 4.99% for 48 month term, and 5.99% for 60 month term, and no down payment offer available to qualified applicants only, and only on new, untitled 2018 and 2017 MV Agusta models. Where no money down is indicated, it is available only to those well-qualified applicants with approved credit. Not all buyers will qualify and if approved may receive a higher rate, depending on credit score. Some buyers will require a down payment in order to receive credit approval. Subject to model availability and dealer participation. Subject to credit approval by FRF, not all applicants will qualify. Financing offer can change or be canceled at any time. Offer commences on March 1st and is valid through April 30th, 2019. This offer cannot be combined with any other offers. Finance offer valid through authorized U.S. MV Agusta dealers only. See participating authorized dealers for details.